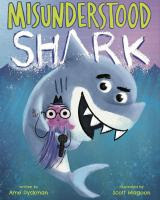 Misunderstood Shark by Ame Dyckman, illustrated by Scott Magoon; April 24, 2018. Orchard Books. 48 pages. Ages 4-8. This book is right up my alley with it's dark humor and sprinkling of factual information. The filming of an underwater show is interrupted by a shark, who seems to be on the verge of eating a poor fish on live TV! But, when he realizes he has an audience, he swears he is misunderstood; he was only showing the fish his loose tooth. He finally convinces everyone he is just misunderstood, only to reveal his true self in the end. Funny, but definitely for older kids due to the dark humor and length. 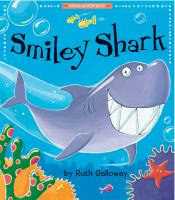 Smiley Shark by Ruth Galloway; March 1 2017 (first released in 2003). Tiger Tales. 32 pages. Ages 3-7. This is a cute story for the younger or more sensitive kids. Smiley Shark is trying his very best to make friends, but his well-intentioned smile just scares everyone away because of his huge teeth. But then one day, the others are caught in a fisherman's net! Can Smiley Shark's teeth save the day? The ending is a slight twist from what most people are likely to expect, so ask the audience first how they think Smiley can help, and see what they come up with. 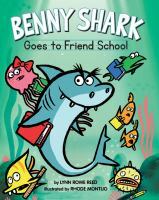 Benny Shark Goes to Friend School by Lynn Rowe Reed, illustrated by Rhode Montijo; July 11, 2017. Two Lions. 32 pages. Ages 3-7. Benny is not very friendly; in fact, he is rather grouchy, rude, and a bit of a bully. But he soon realizes that he is lonely without friends to play with, and tries to make friends with the other sea creatures by ordering them to play with him. Janice Jellyfish kindly explains that's not how it works, and takes him to Friend School, where he learns to share, be polite, and listen. But, when the ultimate test of friendship comes, will Benny make the right choice? Like all the others, this book is mostly pure silliness with a nice rhythm and rhyme, but this one also sprinkles in a few facts, with more factual information at the end. Kids who are familiar with this series will especially love it. Though I like the idea of facts being sprinkled in, they interfered with the rhythm a little bit. I liked how it ended with it all being a daydream and nobody in danger of dying. 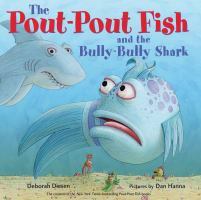 The Pout-Pout Fish and the Bully-Bully Shark by Deborah Diesen, illustrated by Dan Hanna; September 5, 2017. Farrar, Straus, and Giroux. 32 pages. Ages 3-7. Mr. Fish and his friends are having fun, until a bully shark comes along. Can Mr. Fish find the strength to speak up for himself and his friends? This has a similar rhyme and rhythm to the original, and has a good (if a bit heavy-handed) message, but lacks the magic of the first book and doesn't have the catchy, repeated phrases. It would be better for a lap-read than a group read aloud. Big Shark, Little Shark by Anna Membrino, illustrated by Tim Budgen; May 9, 2017. Random House Books for Young Readers. 32 pages. Ages 3-6. I don't normally use early readers for storytime because they are so small, the text is short and choppy, and some of them are 50-60 pages long, but I would make an exception for this one. I think this would would work for storytime for a small group of toddlers and just-turned 3-year olds. It is short, and has very simple text focusing on contrasting terms as the two sharks try and fail at catching lunch, until they work together. 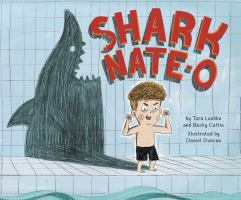 Shark Nate-O by Tara Luebbe & Becky Cattie, illustrated by Daniel Duncan; April 3, 2018. Little Bee Books. 40 pages. Ages 4-8. This is probably one of my favorites of this year's finds, and I am sad I didn't get the chance to use in in storytime (but there's always next year). Nate is a little boy who loves sharks and knows quite a bit about them, but surprisingly, Nate doesn't know how to swim. The story follows Nate as he learns to swim, eventually joining the swim team! There are references to various species of sharks throughout the story, followed up by two pages of facts at the end. But my favorite thing about this book are the references to the two most well known shark movies. The title is obviously a nod to the campy, so-awful-it's-funny Sharknado movie franchise, and there are also references to the movie that started it all, Jaws; Nate apparently lives in the town of Amity and at one point he tells his swim teacher that "We're going to need a bigger float". I love it when children's materials include a few jokes for the adults' benefit as well. This book is a bit longer and probably best suited for older preschooler and school-aged kids, and would be great for family storytimes with plenty of adults to appreciate the references. For non-fiction books to learn factual information about sharks, visit your local library and look in the 597.3's.